This past weekend we had taco night! I prepared beef tacos for my husband and decided to make myself tempeh tacos. It was a pretty improv recipe but here’s the idea. 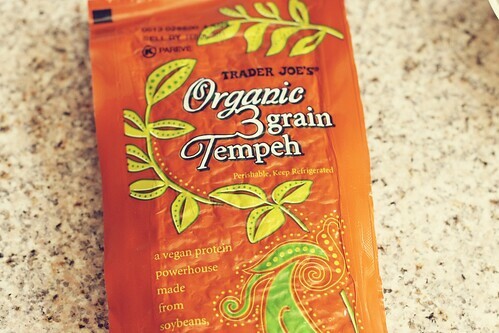 I was happy to say my tempeh tacos were delish! Heat a frying pan on medium high heat. Add a touch of olive oil and onion. Once onion is beginning to soften, add tempeh and brown. In a bowl mix all of the remaining ingredients. Add seasoned water to the pan and cook until water is almost gone and tempeh has cooked through. Serve with taco shells, chopped lettuce, tomatoes, and taco sauce. Goes great with seasoned rice and black beans.